How do you clean a home or apartment when you are moving out? Both sales contracts and leases usually stipulate that the property must be broom-clean. Unfortunately, sometimes broom-clean is not good enough for the people moving in. Our advice in such cases is to not sweat it. As long as you have met the requirements of the sales contract or lease, you have nothing to worry about. Broom-clean is a term used to describe a state of basic cleanliness. It means you have swept the floors, wiped down the kitchen counters, vacuumed the carpets, done a thorough cleaning of the bathroom, etc. Leaving a home in broom-clean does not require you to put on a fresh coat of paint and disinfect the kitchen floor to make it clean enough to eat off. We say don’t sweat it because there are some people who just will not be satisfied until they do their own cleaning. That’s fine. To each his or her own. If you are the kind of person who uses antibacterial wipes to clean door handles and light fixtures, that’s great. Make the house as clean as you want. The point here is that you are under no obligation to meet someone else’s a standard of clean when moving out of a house or apartment. You are only required to meet the generally accepted requirements of broom-clean. If that is not clean enough to whomever is moving in, that is not your problem. On the other hand, be sure that your standards of cleanliness rise to generally accepted norms. 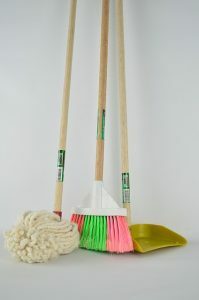 Just because you think the house or apartment you are vacating is broom-clean doesn’t make it so. How can you tell? Ask. If you are not sure what broom-clean means, ask your real estate agent or apartment manager. Either will know what it takes to meet the stipulations of your sales agreement or lease. And if you’re still not sure on moving day, ask him/her to stop by and take a look before you walk out the door for the last time. Remove all trash along with any items that are not being transferred to the new occupants. That’s about it. Pretty simple, right? The only thing you really have to worry about, other than what is listed here, is explicit language in your sales contract or lease agreement that stipulates you do more than broom-clean. This sort of language is rare, but it does exist. If you are renting an apartment, you are likely obligated by law to leave the apartment in the same condition you found it, less normal wear and tear. This is where broom-cleaning is important. Do not leave a mess behind for management to clean up or you will risk losing your security deposit. If you’re selling a home, let your cleaning be governed by common sense and courtesy. Leave the home in the same condition you want to find your new home upon arrival. If you follow the golden rule of treating others the way you want to be treated, you should be okay. Provided you broom-clean according to established norms, you can move on with confidence. Don’t sweat it if the people coming in behind you decide that your cleaning job wasn’t good enough. It is okay to leave them to clean according to their own standards.